Felicia Day four years ago, on my laptop. Fugit! It's been Four Years! 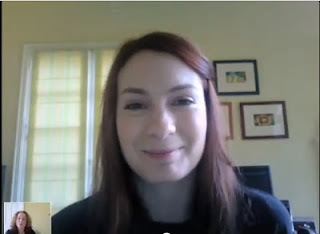 It's hard to believe, but it's been four years since I stopped freaking out long enough to interview Felicia Day. Back then she had just managed to negotiate a ground-breaking deal with Xbox after sticking to her guns over ownership of her work, and Season 2 of The Guild was just airing. Who could have predicted that Season 6 of The Guild would be airing four years later? Since that interview I've kept tabs on Felicia and watched her develop her career with aplomb. She has worked hard to make her future her own, and her successes have been many. I hope one day we meet up and have a nice cup of tea and a scone. That would do very nicely.